ATM Machines Pittsburgh Why ATM Management? 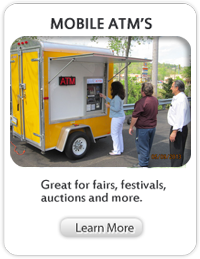 ATM Management is a provider for ATM products and service. We offer ATM installation, maintenance, signage, monitoring, and repair. ATM Management is in complete ADA compliance with new Automated Teller Machine federal regulations. Our company began an ATM placement program at no cost to local service stations, taverns, convenient stores, hotels and restaurants. Our ATM placement program offers a unique opportunity to provide unprecedented financial service to your clients and a secondary stream of income to the property management. Our clientele represent many well-known properties where first-class service and a �zero defects� standard are expected. We will provide you with funds management and monitoring program using the latest visually appealing machine in the industry. Your first-class property deserves to have a relationship with a company like ATM management whose foundation is made up of a commitment to excellence and professionalism.